Goa has always been a favorite destination for beach lovers in Mumbai. But due to the huge initiative by MTDC to promote tourism in Sindhudurg, Tarkarli is now definitely counted among the most popular beach destinations with people in Maharashtra. Tarkarli is not as developed and commercialized like Goa and it lacks the night life factor. But if you are looking for unadulterated beaches, beautiful long coastlines and finger licking good food, Tarkarli is a place you must visit. How to travel to Tarkarli? You can take the Konkan railways to reach Tarkarli. It arrives way before Goa or you can simply drive there. No airports yet in Tarkarli, but let's hope it soon changes. The most popular hotel to stay in Tarkarli is definitely the MTDC Beach Resort which has a great location, as it is built on the beach. So every morning you can walk out from your room and reach the beach in less than two minutes. In Tarkarli, you will mostly find home-stay accommodations, which are comfortable, clean and light on the pockets. We stayed in a home-stay accommodation too, and it was much better than we expected. I visited Tarkarli in January 2016, and below are the top 5 things to do in Tarkarli according to me. I was surprised to see that the Tarkarli beach, inspite of being so famous with beach lovers is well maintained and still not too crowded. Apart from beach activities, the Takarli beach is perfect for long evening walks on the sand because of its long coastlines, while you feel the soft sand slip under your feet. On our trip to Tarkarli, we walked to the beach every evening to watch the sunset and ordered chai from the MTDC restaurant which is located right on the beach. Many of my friends have tried snorkeling and scuba diving in Tarkarli and they loved it. So trying that also might be a good option. Camel rides on the Tarkarli beach surprised me and I had too much fun riding on the camel. They charge around Rs. 50 per head for a 5 minute camel ride. There were horse carriages too, but we didn't ride them. Around 4 kms away from Tarkarli beach is Devbagh Sangam. Devbagh means a Garden of the Gods and Sangam means confluence. Devbagh Sangam is where the Arabian sea meets Karli river. This too is a beautiful location to visit. On one end you see the calm and quite backwaters of Karli river and on the other, you see the gushing and raging waves of the Arabian sea. The sand is white and the beach unadulterated. You can also enjoy boat rides on the backwaters of Karli river. Though we didn't do it, it would be a good idea because of the natural beauty surrounding this place. 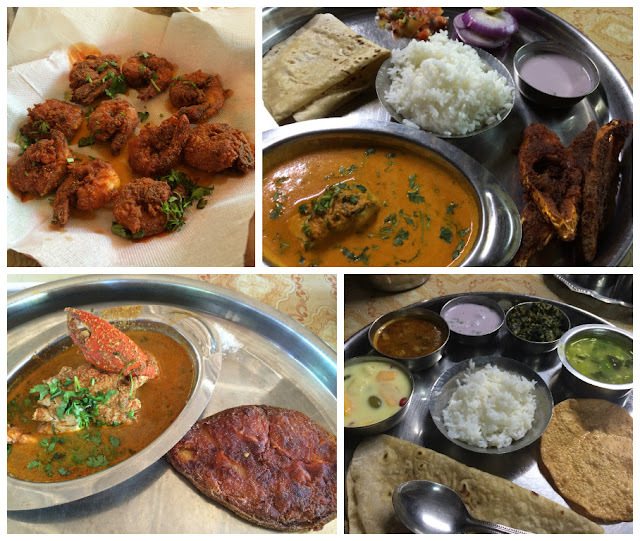 The main cuisine in Tarkarli is Malvani food. And it is indeed a paradise for sea food lovers. There are hardly any fancy restaurants and hotels in Tarkarli. Though we liked the food at the MTDC restaurant, we enjoyed the food more from local home-stay kitchens also know as 'Khanawal'. Make sure you sample the Ghaavne and coconut chutney for breakfast. Ghaavne is a variation of the famous Neer Dosa. The difference being they are thicker in texture and since they are made from 'ukda chawal' or parboiled rice and roasted on iron girdles, it is slightly brown in color. Every restaurant/khanawal that you eat at Tarkarli will serve you Solkadi/Kokamkadi. And if they don't, please ask them for it. Solkadi is an appetizing drink and an inseparable part of Malvani cuisine. It is made from coconut milk and kokum juice with a mild flavoring of garlic, cumin and salt. It is pink in color and acts as a soothing agent when accompanied with the spicy and hot Malvani curries. For dessert, ask for Ukdicha Modak, which are sweet dumplings stuffed with grated coconut and jaggery. Since the home-stays here are not too big in scale, they only make food in limited quantities as per order. So make sure you give order for your breakfast/lunch/dinner a day or atleast a few hours in advance to avoid going hungry for the day. And last but not the least, everyone who has visited Tarkarli will tell you about this restaurant called 'Atithi Bamboo". It is by far the best restaurant in Tarkarli and its specialty is sea food. We did try this place, and it was soooooo good. I recommend you try it at least once when you visit Tarkarli. You might not be religious, but exploring nearby temples in Tarkarli in a rented car is a good idea. The Kunkeshwar temple is a must visit, because it is built on the Kunkeshwar beach. The beach is beautiful and the temple is huge, artistic and gorgeous. One more fun thing to try at Tarkarli would be cruising in House Boats. They are quite popular, but since I didn't experience them, they do not make it to my list of must do things in Tarkarli. Hope you enjoyed reading the post, as I relived my Konkan holiday. I could literally go there for food. Never knew about this place, I need a diff beach to explore. Using RentalCars you can find the most affordable car hire from over 49,000 international locations. It's a amazing post, This is very useful, Thanks for sharing this information with us. Lovely post to read. I am eager to read other posts of your blog. Thank you for sharing - Good Luck. A tour never depend on seasons. It will be happen when you want. A tour like https://www.imanali.in/manali-tour-packages-ahmedabad depends on you that when you want to go. A tour makes your free time into quality time. Some kind of persons like to go for a tour in summer vacations. It is a best time to go for a tour which place related to some kind of snow and some kind of water. Just like some persons like to go for a tour which is related to water and some kind of funny things. On a tour, You can enjoy all the things. By the way, A tour also enjoyable for everyone. When you heard for a tour then you can feel some kind of excitement. These all things are really so interesting that we can do while travelling. Good guide for travellers.. I Will keep these all things in my mide while travel. Thanks to share these all wonderful tips with us, good guide keeps sharing. Amazing things these all things seems so interesting that we can do while travel thanks for sharing this guide with us. Thanks for sharing your tour experience of Tarkarli. I read your post. I really appreciate form your post, your post is very beneficial for every reader including me. Lovely images of Tarkarli Thanks for sharing us Definitely Tarkarli is an amazing place for travelling. Wow! This place looks really very beautiful and interesting also. Loved your post and pictures. Thank you so much for sharing a great post and experiences. An Amazing Things that we can enjoy while travel, I will also follow your travel guide. Thanks for sharing these all tips with us.